Until fairly recently, when I thought about Southern Ontario, I didn't think about Ginseng, but lately I have realized what a wonderful herb and important crop it is in this area. Much of the herb that is grown here in Ontario is exported to China which is the largest purchaser. The sandy soil of this area, especially around Delhi, which was so good for tobacco growing, is also perfect for cultivating this herb. 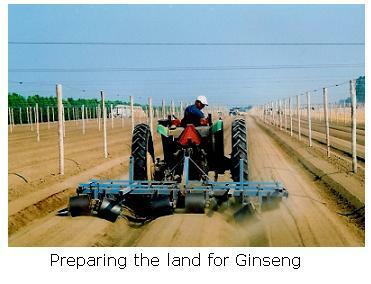 Ontario is North America’s largest grower of Ginseng, with around 220 growers and over 5,000 acres of land under cultivation. Each year around 3,000,000 lbs of root are grown in Ontario and that figure is growing. Many people may not realize, I know I didn't, that this plant is native to Ontario, and was discovered here in the 18th century by Jesuit priests, who then began to look for uses for the herb. The past 25 years has seen an increase in the farming of this herb, as this has coincided with the government's reduction in support to tobacco farmers. However, farming this herb requires a large investment of capital and involves risk - since there is no crop insurance, and it takes three years before there is actually a crop to harvest! The roots are harvested after 3 or 4 years, cleaned, dried & stored in barrels until sold. The process of harvesting has improved enormously with the use of mechanical harvesters, which allows hand-sorting on the machines that are digging the roots. 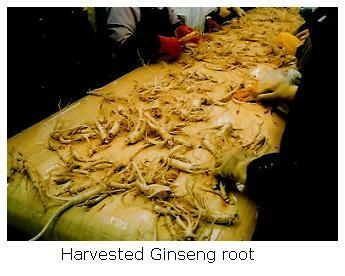 Much of the ginseng production process, however, still requires human labour! At least 80% is sold to Asia, where it is processed and often shipped back to North America as tea, pills and other products. 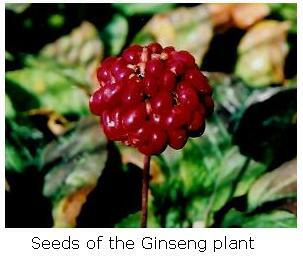 North American ginseng, including Ontario grown, has a variety of uses. It was originally used for its healing properties by aboriginals long before the arrival of European settlers, who appreciated its cooling effect that helped to relieve stress, calm the body and strengthen the internal organs. These effects made it a valuable, exportable commodity to China, as early as 1716. Today it is important for its health-giving properties including research studies for the treatment of Type 2 diabetes, the prevention of respiratory infections, memory improvement, to leading edge work on breast and prostate cancer.